There are no comments for Lucille Desiree. Click here to post the first comment. 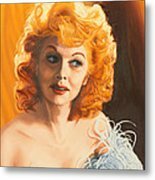 Lucille Ball's given middle name was Desiree. Wanda Clark was Lucy's personal assistant and secretary for many years and I was fortunate enough to meet Wanda through a mutual friend. 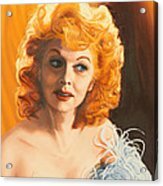 Wanda has a collection of photos and portraits of Lucy and her family and friends and she was kind enough to loan me some of them to paint from. 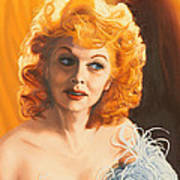 This painting, Lucille Desiree, was adapted from a publicity photo that was taken when Lucy first came to work at MGM Studios. For this photo shoot the studio had her get her hair dyed red. For this shot the photographer had her pose with a feather boa, leaning against the back of a hob-nailed leather chair, which hid her right shoulder and part of her hair. For my painting I deleted the chair. Before she came to MGM, Lucy had modeled and acted as a blond and as a brunette but after this shoot she always maintained her signature red hair. 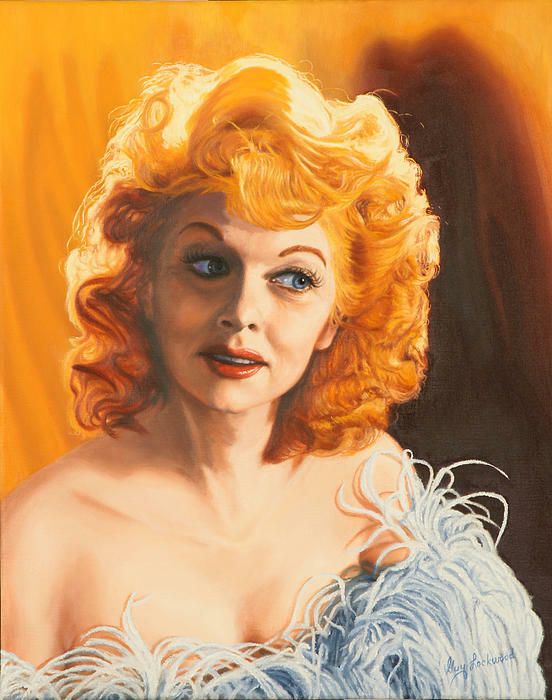 This photo shoot produced the first photos of Lucy as a redhead.